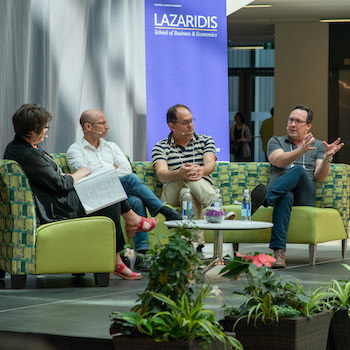 On June 19, the Lazaridis Institute for the Management of Technology Enterprises hosted its inaugural Entrepreneurship Research Day where students, professors and industry experts discussed what’s in store for the future of entrepreneurship research. The panel was a catalyst for attracting a large audience of academic and grad students and was made up of three scholars, Marc Gruber from the École Polytechnique Fédérale de Lausanne, Holger Patzelt from the Technical University of Munich and Dean Shepherd from the University of Notre Dame. Each panellist was asked to provide their assessment of where they see entrepreneurship scholarship going in the near future and each researcher brought their own approach to bear when answering the questions. The panel discussion quickly evolved into an examination of how entrepreneurship scholars can apply theories from other disciplines as a way to move the profession forward. Gruber explains that 30-40% of start-up companies tend to want to better society in some way and assessing their actions based solely on economic and financial measurements does those companies a disservice. Shepherd adds that while these paradigm shifts are occurring and new theories are being applied to entrepreneurship, "we must be sure we're not just engaging in theory borrowing but rather engaging in theory bricolage to bring together the best parts of theoretical models to help explain phenomena. Scholars are like entrepreneurs in a way because we are always looking for the next opportunity to produce useful things." The inaugural Entrepreneurship Research Day continued after the panel discussion with a competitive poster session, networking time and poster prize presentation.